Probably not the kind of endorsement UKIP were looking for. But anyone thinking of voting for UKIP should remember that – if they do – they will now be comrades in arms with the BNP. I doubt UKIP find that endorsement very helpful. 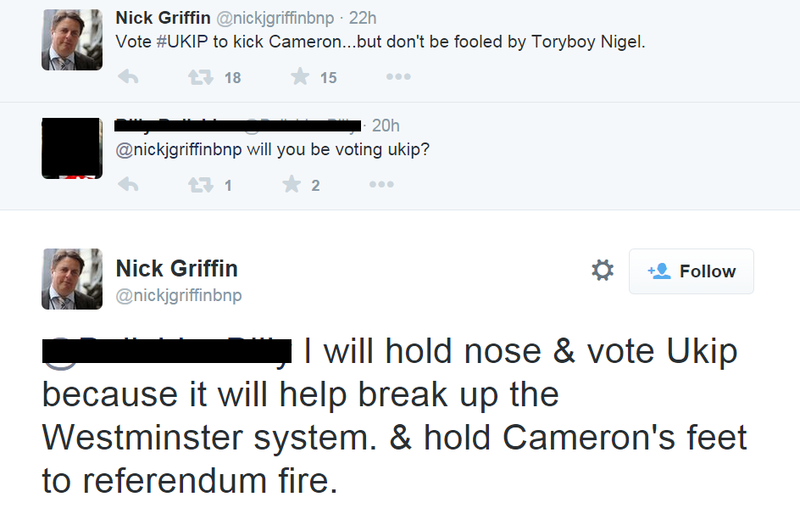 Like the BNP, I hope UKIP ultimately find themselves in the dustbin of history. I am not surprised. About a year or so ago, one UKIP councillor in Wiltshire had to resign after he made comments influenced by the myth of ‘Eurabia’. This is the idea that in the next few decades Europe will literally be swamped by Muslims, so that the continent will be Islamicised and its White, indigenous peoples marginalised and confined to ghettos. You can find very nasty recruiting videos for the Far Right on the web that present this distorted vision of the future, and predict a war between Muslims and their leftists enablers on the one hand, and ‘Nationalists’ on the other. This particular Kipper seemed to have seen and believed it. Although he was disciplined, clearly despite Farage’s rhetoric there are more than a few in UKIP, who support the Far Right, and the sentiment is being reciprocated. Well it’s not an endorsement is it he said he will hold his nose to vote UKIP, but clearly that is better than voting for annoys the other two parties, conlablibdum and green, where apparently holding his nose wouldn’t work.